In PA’s ultimate swing county, the race for the county courthouse could be among the closest in the state – and might set the tone for 2012. By any definition, Bucks is a PA bellweather. It came out for Ed Rendell and Bob Casey in 2006, and Rep. Mike Fitzpatrick beat Patrick Murphy by a mere 1,024 votes. 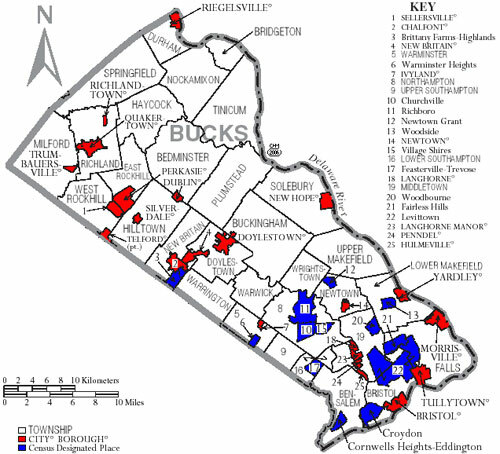 But unlike neighboring Montgomery County, and despite a 191,778 to 178,057 voter registration in favor of Democrats, Bucks went red in 2010 for Tom Corbett and Pat Toomey, and Mike Fitzpatrick won by 19,026 votes. “Bucks County elections are always a good bellweather for Pennsylvania. It’s demographics and partisan distribution make it a great place to look at in terms of identifying the direction of voters in the Commonwealth,” said Dr. Chris Borick, Director of the Muhlenberg College Institute of Public Opinion in neighboring Lehigh County. This year, incumbent Commissioners Charley Martin and Rob Loughery – along with Republican insiders across the state – are hoping the GOP’s momentum holds. They point to Bucks County’s stable economy as evidence of their leadership. Democratic Commissioner Diane Ellis-Marseglia and Doylestown Borough Council President Det Ansinn, critical of two and a half decades of GOP administration, think voters are ready for a change. Click here to read PoliticsPA’s interview with Martin and Loughery. Click here to meet Marseglia and Ansinn. It’s clear why Democrats think they have a shot this year. The Republican ticket also won’t be as well known as last election. Jim Cawley isn’t on the ballot this year, and newcomer Loughery has never held elected office before. The other row offices results from 2007 are more favorable for the GOP. Republican candidates for Register of Wills, Treasurer, Clerk of Courts, and Coroner swept their opponents by 10.66, 6.06, 2.66 and 5.9 percent, respectively (Fun fact: the Dem candidate for Register of Wills was Kathryn Boockvar, who’s now running for Commonwealth Court). Economically speaking, Bucks County is on a fairly even keel. Unemployment is consistently lower than the state average, and Standard and Poors assigned it a AAA bond rating. And the local GOP is well known for its successful get out the vote efforts. However, the key issue may be uniquely local. PoliticsPA looked at this a bit in May, but suffice it to say that Republicans are saying the ordeal had nothing to do with the Commissioners, while Democrats are blasting a culture of corruption resulting from one-party control. Expect much of the paid media from the GOP to focus on the economic story of Bucks, and Dems to talk about a need for change. So far, the Democrats have the advantage when it comes to raising funds to spread that message – they lead their GOP opponents $140,000 to $100,000 in cash raised, according to both campaigns. Being such a swing county, it’s little surprise that Bucks was one of just two PA counties to make both the Democratic and Republican list for Best County Chairs this year (in addition to Chester Co). Both local parties are optimistic about the race. “Each election is different. Four years ago, we came within 1,400 votes of taking the third seat and Diane placed second, That was significant. At that time, we were down in registration about 15,000 to 20,0000. Now we’re up about 14,000,” said Dem Chairman John Cordisco. Caroline Johnston and Chris Bowman contributed to this report. Uhh… If you’re talking about 2006, which I think you are, you mean that Murphy beat Fitzpatrick. Charlie Martin is just plain awful. He doesnt do anything for the common folk and is a terrible person. He hates people with disabilities and has failed the taxpayers in order to line the pockets of his supporters. Charlie Martin is the Jim Matthews of Bucks County. A joke. At least the Republicans had the good sense to throw Matthews out on his ear. Not so here in Bucks where there is a dead man walking as party chair and commissioner chair! As a Republican all my life I see the need to drop.drop the party line and get rid of dead wood like Charlie Martin. The future is where were need to got and not Martintimes. Old time politics are out. I will be voting across party lines.